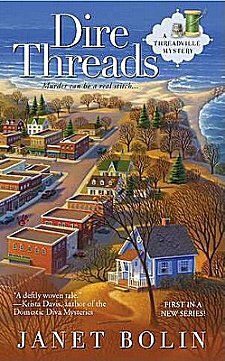 First Line: For the first time, my new boutique, In Stitches, was officially part of the Threadville tour, which was both exhilarating and daunting. Threadville is a small town called Elderberry Bay on the Pennsylvania shores of Lake Erie. Several women following their talents and passions bought property in town, opened their textile businesses, and "Threadville" has become a welcome spot for many tourists to learn new skills and to spend money to increase their thread, yarn, and fabric stashes. Willow Vanderling has followed suit, opening In Stitches to teach people needle arts-- preferably with sewing machines. At the bottom of her property is a small cottage that's close to the river and by a hiking trail, and it's Willow's intention to refurbish it to rent to vacationers. Her plans are dashed by the town zoning commissioner, Mike Krawbach, who has his own ideas on how that piece of property can best be improved. When Willow learns what Mike has planned for her property, she is livid-- and makes the mistake of saying she's going to kill him in front of several witnesses. You just know what's going to happen next, don't you? Sure enough, Mike dies that night on Willow's property, and the town policeman who should've retired long ago, is all for forcing the facts to fit his theory that Willow is the killer. Out of self-defense, Willow and her friends turn into rather inept sleuths in order to find out who really killed the zoning commissioner. Willow is an extremely likable character. She was a whistle-blower on an embezzler while employed in New York City, so you know she's not afraid to take a stand and do what's right. She's also surrounded by cast of colorful friends who are going to help brighten the pages of future books in this series. It also doesn't hurt that there's no shortage of good-looking available young men in town, either. The mystery had just enough twists and turns to keep me guessing, and I loved the textile slant to the proceedings. In fact, this dedicated needlewoman who prefers holding a single needle in her hand to operating a computerized sewing machine enjoyed Willow's classes and design sessions so much that I've actually been thinking about investing in a sewing machine. This is a light, fun mystery that is a perfect beginning to a new series. You don't have to enjoy needle arts to enjoy the book, but if you do, you're going to be in heaven! Cathy - This is a nice, light series, so I'm glad you enjoyed your first visit to Threadville. I'm from PA, so I particularly like the setting. And yes indeed, the craft - the art in many ways - of needlework and sewing come alive in this series. I got all excited - I used to work with a Janet Bolin in CT and thought it might be her, but alas not. Anyway, this sounds like a fun, light read to fit in between longer, more serious stuff. I love to sew too, whenever I can make the time. I stopped doing needlepoint for years, but now that I'm married to someone who enjoys watching TV-- and I enjoy being with him-- I've picked it up again, and I'm really enjoying it.